Governor Cuomo announced that state-supported solar increased nearly 800% from December 2011 to December 2016, which is an important milestone to the state’s goal of reaching 50% renewable energy generation by 2030. Nearly 65,000 projects have been installed through the end of 2016, compared with approximately 9,000 projects prior to the end of 2011. The 65,000 projects accounted for nearly 744 megawatts of solar capacity or enough to meet the needs of more than 121,000 homes. The growth in solar was driven by a decline in solar equipment prices, strong NY solar incentives and the growth of solar companies in NY. NY-Sun aims to add more then three gigawatts of installed solar capacity by 2030. Long Island has installed the most megawatts at 214 megawatts from 24,428 installations. Long Island was the first region to meet NY’s megawatt block target. 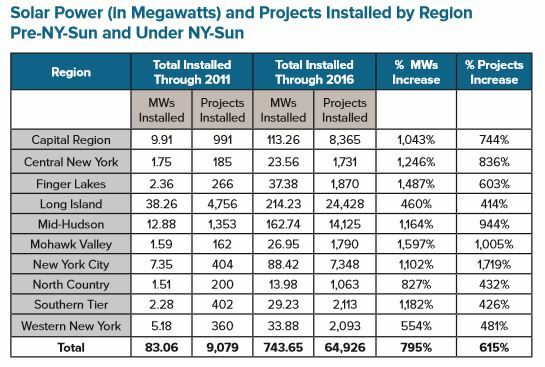 The Capital Region and Mid-Hudson experience similarly strong growth in installations. Seven of the 10 regions experience greater than 1,000% growth. 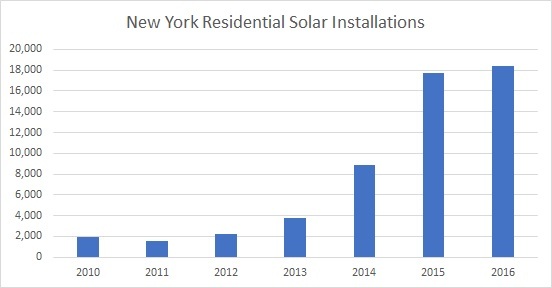 The NY residential solar market continued to grow in 2016, albeit at a lower rate than 2015. The state also has relatively low solar penetration compared to other solar markets including California and Arizona, so growth should continue in 2017. Growth has also been driven by an increase in the availability of solar loans, which have changed the dynamic for consumers in the lease vs. buy solar decision.